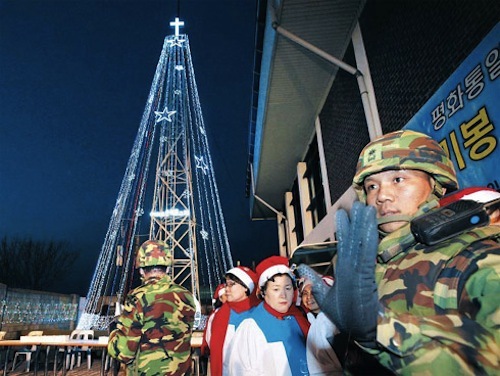 Potentially Deadly Christmas Tours of North Korea Now Booking! Here’s the catch. It’s a Christmas tour that could get you killed if you decide that everyone’s favorite communist neighborhood needs a little old-time religion. If you’re even suspected of being a part of any activity even remotely associated with religious activity? You could end up celebrating your last Christmas in a labor camp for about a decade…or worse. You really don’t want worse, do you? Subject: PRESS RELEASE: CHRISTMAS IN NORTH KOREA 26/09/2013, Beijing, China, Taedong Travel. PRESS RELEASE: CHRISTMAS IN NORTH KOREA 26/09/2013, Beijing, China, Taedong Travel. What is your most cherished Christmas memory? Novelty knitted jumpers, overcooked Brussels sprouts and family arguments? Time to try Christmas in North Korea! 2013 is the first year that tourists have been permitted to enter North Korea throughout winter – you can now join local North Koreans for a Christmas and New Year to remember! Will you be visited by Santa Claus, enjoy Ginseng flavoured Turkey or listen to familiar Christmas carols? Just how is the festive period celebrated in North Korea? No one knows – this is the first opportunity to spend the Christmas in North Korea, no tourist has ever been allowed in the country at this time before. Those who visit will have the most unique Christmas of their lives, impossible to predict moments, such as building a snowman in Kim Il Sung square, could be just one of the many highlights of this truly one-of-a-kind trip! After a great deal of effort Taedong Travel have finally secured permission to operate the first Christmas tour of North Korea, taking place from December 24th to Sunday December 29th, (5 days, 4 nights). Price starts at only 740 EUR, a small price to pay for the memories and bragging rights that a Christmas spent in North Korea will bring! Taedong Travel is a specialist North Korea travel organiser founded by Stuart Leighton, a frequent visitor to the DPRK since 2008. Taedong Travel has published a full range of tours to North Korea in 2014 for the discerning budget traveller. In an increasingly open market Taedong Travel Company has carved a niche for itself as the go-to company for those looking for the maximum possible experience on the lowest budget. And if you want to freak out a loved one or just make people scratch their heads, you can print out a copy of this promotional pamphlet and leave it lying around or putting it in a fancy envelope and surprising someone you love with it just to see the look on their face. You know….to remember you by. Posted in Korea, North Korea, Weird Excursions, Weird Tours | Comments Off on Potentially Deadly Christmas Tours of North Korea Now Booking! You are currently browsing the archives for the Weird Tours category.